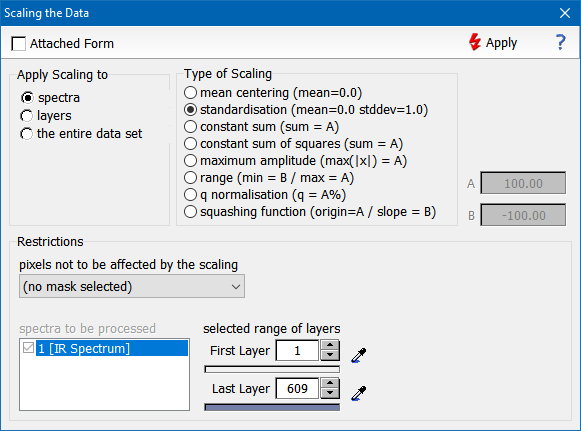 Mean centering The selected data items (layers, spectra, or all data) are scaled in such a way that the mean of each item becomes zero. Standardisation The selected data items are scaled to a zero mean and a standard deviation of 1.0. Please note that the standardisation of data may be problematic if the data contains unusually large outliers. In this case q-normalisation is a better alternative. Constant sum The selected items are scaled to a constant sum defined by the parameter A. Constant sum of squares The selected items are scaled to a constant sum of squares. The sum is specified by the parameter A. 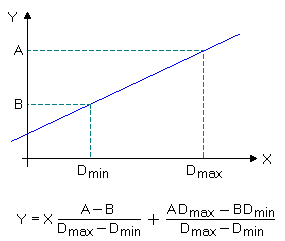 Maximum amplitude The selected items are scaled in such a way that the maximum absolute value of each item becomes A. Range The selected data values are scaled to cover a range between A and B.
Q Normalisation The selected data range is scaled to zero median and a difference between the median and the q-percentile of 1.0, with q (in %) given by the parameter A. Q normalisation is largely insensitive to outliers and should be used whenever you are expecting severe outliers. Squashing Function The selected data range is compressed by applying a sigmoid function ("squashing function") to the interval [-1,+1]. The parameter A specifies the origin (offset) of the squashing function, the parameter B defines the slope of the function. Hint: If you abort the scaling operation the data will be partially changed and thus unusable for further processing. After aborting the scaling you should reload the data set from disk.